is never a good sign. But what could she say? as the day they were made. crossing the border of the Sierra Nevada from Oregon to California. along the cusp of Mount Shasta. Already there are ranchers waiting, armed. True, it’s only one wolf. Except that a wolf is never just a wolf. walking around outside our bodies. out in the dark, howling. my mother, a third floor walk-up. into the back room, she can’t recall. a child, a girl, no more than two or three. eyeing an object with great interest. A pebble, or a bright coin. must have happened very slowly. leaned out the window, smiled. what’s in my purse? she asked. down the wide street, horns blaring. under the weight of their backpacks. that hold us in the balance? he aimed at his heart. held her to her chest. 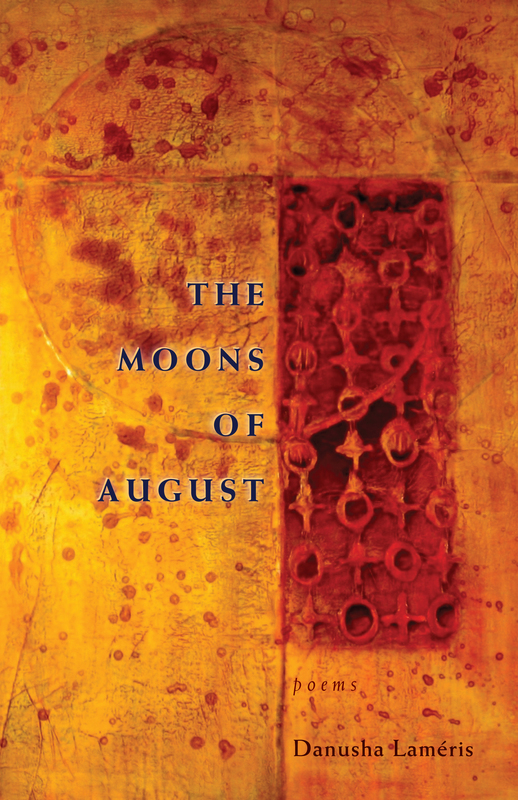 Today’s poems are from The Moons of August, published by Autumn House Press, copyright © 2014 by Danusha Laméris, and appear here today with permission from the poet. Editor’s Note: I first discovered Danusha Laméris when I featured her stunning poem “Arabic” in the fall of 2013. When I read that her first book was forthcoming this year—and chosen by Naomi Shihab Nye as the winner of the Autumn House Press poetry contest, no less—I begged the poet remember me when the book was released. When it arrived I read, devoured, re-read, explored, breathed, bled, and grew whole once more within the boundless confines of its pages. Through Laméris’ words I was the first woman born; I knew the burden—and relief—of being Eve. I was as old as time and as all-encompassing as nature. I was as helpless and as grieved as a mother, and as powerful. The Moons of August is small and light and fits effortlessly in my hands. Yet it reaches far back to human origins and delves deep into the human experience and the complex soul of (wo)man. “With,” as Dorianne Laux so aptly states, “language clear as water and rich as blood,” this is a book to read when you want to feel alive, from the very atoms that comprise you to the farthest reaches of your white light. Want to see more by Danusha Laméris? This entry was posted in Danusha Laméris, The Moons of August and tagged American Poetry, Arabic poetry, Biblical Poetry, book-length poetry, Feminist Poetry, Love Poetry, Midrashic Poetry, Nature Poetry, nostalgic poetry, Peace Poetry, Poetry, Poetry of Faith, Poetry of Loss, poetry reviews, Spiritual Poetry. Bookmark the permalink. ‘~~~not to pretend anymore that the terrible calm was Paradise. '” Ouch! If we’d only known, huh?